In 20 years the impact of self-driving autonomous cars will be astonishing. Maybe you should read this article in reverse and start with what it looks like in 20 years and how we get to that from here. This is the biggest thing since the cellphone. It will change everything about how we go about life and even I believe how we live and where. There are several technological threads going through this article that underpin the predictions. Battery technology is going to get better. There is enormous work in improving batteries that is starting to see real progress. We live in an age of magic and I have written about this in another article here. Because of the economic efficiency of batteries and electric cars they become dramatically cheaper to drive over time increasing more rapidly the fuel economy of the entire car fleet more rapidly than ever before. I predict in 20 years the average fuel efficiency will be 160 miles per gallon equivalent over all cars in the US. This efficiency is key to the changes I predict because it allows for faster car travel speed as well as larger vehicles. We will have a renaissance of the ridiculous cars of the past. There will be tremendous improvements in the sensors and logic that enables self-driving to be better and better. The social impact of these changes will create new markets, new ways of doing things, new problems and solutions to problems we never seemed to think would ever go away. I get ahead of myself. Let’s get started by looking at the short term. The impact of self-driving cars may be less than people estimate in 5 years because there is a bit of an over-hype at this time for what is possible in the short term. We already see a little kickback from the too high short-term expectations. So, let’s imagine this far away time that is 5 years from now and predict what are the likely known impacts of plans already in motion and technology that is already in production or close to production. Sales of self-driving cars are limited by the ability to put things into the manufacturing output of the major car makers. Tesla by itself is a fraction of a fraction of the market but the ideas it has launched have become hot and many manufacturers are offering electric cars in the next few years. Even more are planning to offer self-driving cars. Within 5 years at least half a dozen or a dozen car companies will be making self-driving cars or partially self-driving. It is entirely likely that by 2021 we will have 800,000 electric cars being made every year and 800,000 self-driving cars. Tesla itself plans to have a production capacity of 300,000 in a couple years. The US consumes 16 million cars a year so 800,000 is 5% of the market. Still small but growing fast. These cars will represent possibly 1-2 million cars on the road or only 1% of the cars on the road still but this will change rapidly. These cars will be limited in functionality. They will not work in marginal conditions like rain, night, fog, snow or ice. They will make mistakes occasionally. Highway driving will be more like an enhanced cruise control than self-driving. True self-driving will be available closer to 25mph on city streets not at higher speeds. By 2021 I predict that Lithium Sulfur or some variation on Lithium Ion technology will double fuel efficiency and that many electric cars will be getting close t0 200 mpg (equivalent). This by itself should drive significant adoption even with gas prices low. Improvements in sensor technology and more sensors will mean that the basic technology that Google pioneered and Tesla and other manufacturers are rapidly developing will be mature enough for low speed totally autonomous driving safely some of the time by 2021 and in some cities. I believe that not all cities will be ready or locations and it will be necessary for cities to “ready” their streets to be autonomous-safe. In any case, sensors will still be largely not as good in fog, low light and in difficult driving situations. High speed autonomous driving will still be problematic. The impact in 5 years won’t be so monstrous but we will start to see the real scaling up of this technology and the real impacts just starting to be felt. For instance, it will be apparent fairly soon how it is cheaper to go electric. It will be apparent that self-driving saves lives, especially drunk drivers. People will start to see the benefits of the convenience and the side effects of that like self-parking and really imagine where this is going. Cars will largely be the same. Some improvements in entertainment options will happen and some cars might offer workstations but the biggest hurdle is going to be that at high-speed self-driving is still problematic and people will realize it doesn’t work so good in marginal driving situations. The social impacts we will start seeing is that some taxi’s will be replaced in some cities. People are already talking about this but it is still far away from having enough vehicles to make a difference or the technology reliable enough. In 5 years we will see this really start. This threatens 2-4 million jobs in the US alone. We may see a backlash from taxi drivers. You will be able to go to a party or dinner and have your car park itself. In 5 years there simply won’t be enough adoption or maturity of the technology to change the world. It is extremely likely batteries will be rechargeable in minutes. Efficiencies will improve and the sensors and technology for recognizing things will mature rapidly. I expect much of the technology to make the future happen completely will be completed in 10 years. From a technology perspective, I believe we will have achieved all we need technologically to transform the car into something else by 2026. The rest is simply enhancements. By 2026 cars will be able to drive at highway speeds and perform safely in almost all conditions better than humans. Most of the country will be autonomous safe and will be drivable. I believe that by 2026 50% of the cars on the market or 8 million will be sold will have self-driving built-in. I also believe electric will be at least 3 million cars/year. There will be 30-50 million cars on the road capable of self-driving and at least 20 million electric cars. The technology will be cheaper and making it into ever cheaper cars. Average fuel efficiency of the US fleet will be climbing very rapidly now to 50 mpg average or higher. One of the biggest impacts is the ability of the car drive while you are drunk. This will cut death rates dramatically on top of the other benefits. From 40,000 deaths / year this year I expect that by 2026 death rates may have dropped to 20-30,000/year. The main limitation in improving death rates more will be simply the fact that self-driving is still only 20% of the cars on the roads. It simply takes a long time to replace so many cars. We will start to see some cars built that have no driver wheel or brakes. We will start to see people using their cars more and more convenience and living options in the cars as well as work options. It is very likely we will see refridgerators and heaters and food storage as well as other lifestyle improvements. Cars may start to get bigger as people realize the efficiency of these vehicles is insane and they can afford more unwieldly designs. People will likely be willing to trade off 50 or 100mpg for a car with lots more space. The convenience of self-driving will really be impacting lifestyle at this time. People may work from their cars large parts of the day. We will see people start to move farther away from work as they face less concerns about the drive time. It will also be so cheap that long drives won’t cost a fortune. People already do a lot of traveling in their cars. The self-driving will expand the use of the car to travel will become much more prevalent at longer distances than usual now. Where people would use an airplane for 200 miles a lot of people will consider that too short to make plane travel worthwhile. The use of the car will expand on travel with people wanting to bring more stuff. The need for bigger cars will be a huge impetus in the market propelled by the economy and convenience cars will be larger and will have more beds and entertainment for groups. By this time the transition to driverless taxis will almost certainly be complete. It will become an extinct profession. You might think of your driver as more of a butler. All of this driving and big cars will be taxing the infrastructure massively. We will need more roads and bigger parking spaces. We will have massive congestion as people spend more of the time in their cars. We will see massive calls for more infrastructure spending. By this time we will start to see the creation of whole new modes of use of the car. I can imagine there could be car parks and car malls where people park and party together around their vehicles. Games or social events around spontaneous car meetups. We may see the return of the drive-in or restaurants that cater to cars like the hop days of the 50s and 60s. We will certainly see the idea that you send your car out to pick people or goods up. The supermarket may have a drop off option where you send your car and they put the stuff in a special compartment. It will be a new renaissance of cars. More people will focus on their car as major possession as they spend more time in the car. We may see the re-emergence of outlandish designs and creativity. There will probably be emergent car companies with niche markets just starting. This will all just be starting in 10 years. Much of this will happen by 15 years. Lithium Air is a battery technology of dreams. It is 5 to 10 times more efficient than other batteries today. It could mean cars with fuel efficiency of 500 miles per gallon. I believe in 15 years we will have lithium air or equivalent in some way. These batteries are light and powerful, safe and cheap. Easy to replenish the electric car will become ubiquitous. By 2031 I am talking at least 120-150 million cars on the road self-driving and 50% of all cars electric or more. In one sense you may say what is taking so long but making 100 million electric self-driving cars is no small feat. At 16 million cars a year it just takes years to replace them all and people don’t have the money to replace all their cars immediately. Nonetheless, I could see a faster transformation than this. I think I am being conservative here. The economics would argue for even more rapid adoption. The fuel efficiency of the US car fleet will be 80-100mpg nearly doubling in 5 years. We will see deaths on US roads down 75% to 10,000/year. The car will now be good enough to drive faster on freeways with self-driving cars able to navigate safely at 90mph and cheaply there will be a revamp of high-speed travel. Our infrastructure, on the other hand, will be under tremendous stress. This is the period of maximum mismatch between the demand and the ability to build roads and infrastructure which takes even more time than making the cars. Highways may become virtual parking lots. So, the ability to travel at 90mph or faster may be a faint dream that happens rarely. There will be enormous pressure to increase the size of cars. Given the incredibly high prices of housing in some of the country cars may become the new homes leadng to even bigger cars, more like RV’s of today. We will see people using their cars for travel of 500 mile trips exclusively making the plane truly useful only for much longer trips. There is an alternate view that people will rent cars and not own cars as much. This is not the scenario I envision because I think people enjoy customizing their environment and they will be spending more time in the car. They won’t want to carry everything with them on their person. Car and transportation will be so cheap having your own is not a problem. The biggest problem parking. In big cities this could be the exception. It is hard to have cars in cities so cities may have many more rent-a-cars. I think we will see the emergence of car cities. You might even see the idea of parking your car outside the city and it comes to you when you want to go somewhere or you take another interim rented vehicle to your car when you want to go outside the city someplace. I see that some highways will start to be designated for autonomous driving only. This will decrease deaths and free up some space. Possibly half the lanes or most of the lanes designated for self-driving in some places. There will be a tremendous ability of people to live farther and farther from work. Higher speed travel means people could live 100 miles away easily and commute. The cities are likely to be stagnant in growth at best. Some people truly love cities not just because of the jobs. So, I don’t predict the end of cities but I see the growth of all the outlying areas. Again I believe we may see the emergence of car cities (today RV camps) but even more and more flexible. Cars will be growing still to larger and larger dimensions. We may have the biggest cars ever built, possibly 4000 sqft home-cars will be imagined or some built as demonstrations but we may see over the following 5 years many more people considering fully mobile platforms for living. At the same time as all this technology is evolving for transportation a similar technology explosion around VR will be happening. I believe some of the travel will start to be mitigated by people traveling virtually. This will impact business first and then possibly other travel. By 2036 98% of cars will be autonomous and electric. Likely 200-250 million cars. Gas cars will likely be outlawed. Death rates on streets will be under 1,000/year mostly freak accidents. Most cars won’t have any human driving option. The average fuel economy of the US fleet may approach 150 mpg. As the infrastructure matures and the technology we will see a steady increase in the speed limits in special lanes or highways. I predict we will have 150mph even going to 200mph lanes. The fuel efficiency of electric vehicles will be so great that such speeds would be economic. I believe we will see the idea of mobile homes truly explode. Much of the world cannot afford the housing cost. At the high speeds of car travel many trips of 1000 miles or less would be done with cars not planes. In this time frame of 20 years, VR will gain more and more attention as an alternative to physical movement. VR will gain new sensors that will enable touch and feel as well as visual and aural connection. Telepresence may replace human presence for many purposes. Also, we will see the first hyperloop being put into operation in this time frame. In my blog on the future of transportation, I talk about the economics of the hyperloop and how compelling it will be. The hyperloop can eventually reduce the cost of travel to almost nil. You could go 5000 miles for the same cost as taking a subway ride. The speed, convenience, and cost-effectiveness are so compelling that I have no doubt this will be a massive change in transportation over the latter half of the 21st century. Like cars, hyperloops take time to build. Rolling out a new iPhone can happen in a day. Rolling out a new transportation system will take a century. Nonetheless, you may want to read my article about the future of transportation. Here is the raw data that underlies the articles. Batteries will be twice as powerful for the weight and be able to cycle twice as many times. Lithium Sulfur is expected to be available in quantity as well as improvements to Lithium Ion and even the possibility of Lithium Air on the way. This will make electric cars far more economic and practical. 800,000 cars a year in the US is achievable in 5 years, self-driving cars will be 5-10%. Our extensive ability to diagnose problems in battery life degradation and to model and literally compute the optimal materials and designs to compensate will give us the ability to make batteries closer to perfect as we did with the gasoline engine. By now gas engines will be dramatically less efficient albeit still cheaper than electric cars in some cases or some markets. Increasing performance and improving reaction time will make these cars able to operate at highway speeds. Parking is a significant inconvenience in many cities. By this time we will have cars that virtually eliminate the problem. We can see there will be a clamor for more self-driving cars as they prove dramatically safer than conventional drivers. To achieve this will be huge. This is 10 million cars /year self-driving and 3 million cars/year electric. Tesla and other electric cars achieve 90+ mpg today. With much cheaper batteries and lighter batteries fuel efficiency should climb significantly. This is the largest and hardest step to achieve since there are virtually a billion miles of roadway in the US to be certified and properly signed, in some cases modified to be compliant. Although cars will not be able to achieve this frequently anywhere near congestion the fuel efficiency and safety of self-driving cars will force higher speed limits to the limit of the technologies reaction time. This requires achieving 10 million electric cars/year production and 20 million cars / year self-driving. Cars will go 150mph on highways safely and regularly, some cars may be allowed to go 200. The main purpose of this blog is to talk about the significant social implications of all the changes I expect above. Some of the impacts of self-driving cars are truly mind-blowing since we have all grown up with the issues of traffic jams, the danger of cars, alcohol and drugs and vehicles, hours per day wasted for some people, high costs of commuting and other things. Self-driving cars impact our actual lives as much or more than the cell phone or any other invention in the last century. Several companies are already getting prepared for this. The ability to go driverless in low-speed situations in some cities will make this practical very quickly. The impact of this will be a novelty at first but one can imagine this becomes more and more practical and starts to create a significant drop in Taxi drivers which could be a significant impact on people’s lives. I have had to spend 10 minutes to an hour trying to find parking. The ability to drop off your car and have it park itself would be a major improvement in my willingness to go into the city for dinner or to meet friends. It will make people a lot more timely if they don’t have to worry about parking. Cars will start to be designed for the non-driver. These will include workstations and more comfortable seating providing more reclining options as well as larger screens for more entertainment functions. This is an extension of a trend already underway. One of the principal things is how much of a security problem this might be if the car becomes an entertainment platform. Pluggable entertainment modules with power would be ideal. A possible impact of this might be to reduce the number of people listen to radio at least traditional radio over airwaves. In 5 years the technology will not work very well in many places and require the human to drive or take over a lot. As I’ve mentioned in other blogs the technology of self-driving cars has several big holes that need to be fixed yet. a) Reaction time needs to be improved, b) Better sensors and redundant to be able to see better in marginal conditions and c) improvements in road signs and notifications so that the cars can be more reliable. On top of this, there must be a lot of learning by the car manufacturers to program the cars to handle all the situations they will run into. We will see a push by the community to upgrade to be self-driving friendly. One of the biggest first cultural changes would be the possibility of drunk drivers to avoid driving. Unfortunately, the general low penetration of the technology and likely the cost will prevent this from completely eliminating the problem right away but there should noticeable decreases that should be extremely positive for the technologies adoption. The ability to remove the drudgery of driving and dealing with traffic and work on other things will have a dramatic positive force for adoption. Massive reductions in deaths due to drunk drivers will be a huge boon but also increasing places where you can drive and faster transportation will mean more people will do things and attend events. By the time we see a significant adoption we will have a dramatic drop in drunk driving related deaths which should be a major cultural change. It might perversely have the effect that people drink more depending on self-driving cars to keep them and others safe. A lot of our life is spent in cars driving to and from work. It is drudgery and a huge consideration in where to live, the costs to get to and from work. This is a major impact on most people’s life that will enable them to be more productive and greatly improve their quality of life. The costs of transportation will fall as the cost of the batteries falls and their efficiency climbs the gas car will start to see significant inroads, more than 50% of new cars will be autonomous capable and electric. Improvements in batteries mean that the 100mpg of today’s electric cars will get significantly better. This will drop the cost of transportation significantly enabling people to drive more. The reduced maintenance costs of electric cars will also attract more and more people and enable them to drive more. Some people will spend dramatically more time in their cars going from place to place rather than at home or the office. More people will visit each other. People will start to move away from using other transportation for distances less than 200 miles. The time to interface to alternate transportation, as well as the cost of that transportation will make using the self-driving car faster, more convenient and cheaper for many trips less than 200 miles. As the cost of the basic technology for motors and batteries falls people will spend more money on making their experience in the car better. In cities, almost all taxis will be self-driving. Public transit options may be decreasing in use noticeably. By this time it is likely that taxis will be a thing of the past for many cities. We will see games and activities focused on self-driving cars. Meetups where people go spontaneously to meet. People will be looking for things to do while in the car. Since driving won’t occupy them they will need new entertainment options. I could see people driving and meeting spontaneously if it is easier for people to get kids or adults to someplace safely. People may be able to send their children to school or daycare or pick them up. This will take some enhancements to make it safe and undoubtedly will resist until it is proven safe. There will be increased congestion as cars are used more and more and increasing demands to widen highways, add more roads everywhere. There may be push back against these cars from those still using the older transportation. There may be people purposely attacking self-driving cars. There may be a backlash to many people having access to such services and abilities that will be impactful to those that don’t have it yet. People will start to feel extremely safe in their cars as death rates plunge. By this time there will be so much data the cars will demonstrate vastly better safety and people will feel more invulnerable to accidents than they do today. This may create bizarre behavior that increases our risks. People may jump out into streets knowing the car will stop. Dramatic usage increases in car and some people making their home virtually in the car. For people who have to travel long distances to work or have a lot of travel in their job they may spend a large part of day in their car. The car will have to adapt to longer periods of occupation. Food, drinks, entertainment, virtual reality and other technologies are likely as well as better sleeping facilities. It is likely vehicles will get bigger since the efficiency is high and people are spending more time. Expansion of the size of cars and use of cars for longer trips up to 500 miles becoming standard in the car leaving intermediate other travel options decimated. Airports will be used mainly for much longer distance travel. By now Self-driving cars will be able to traverse highways at high speed and speed limits may be raised significantly. This will make using your car to get to travel destinations easier and may allow people to travel more. Self-driving cars will be able to drive faster when other self-driving cars are the only other cars. This may prompt special highways and lanes for self-driving cars. There will be special villages for people camping in self-driving cars in cities and park and recreation areas. People will buy smaller houses or even eschew houses for completely mobile self-driving vehicles. The mismatch between existing roads and the new needs will be maximum here as much increased use of roads will meet the inability to grow infrastructure fast enough. This will drive paradoxically the need for self-driving cars as people will not want to be stuck in jams without being able to do other things safely. We may see here the situation once described in a Dr Who movie where people seem to spend their lives in their cars in traffic jams. The extensive waits may drive people to other transportation means simply because they are faster. While you won’t have to drive during a jam the overall time may climb and this may become a huge issue. Eventually, the hyperloop will have an enormous impact on transportation. I base this on the economics of the technology. My blog on the future of transportation talks about this. Gas and non-self-driving cars will be banned. It will simply be a car. By now gas cars will have been outlaws and be uneconomic. They will be a memory fading quickly into the past. 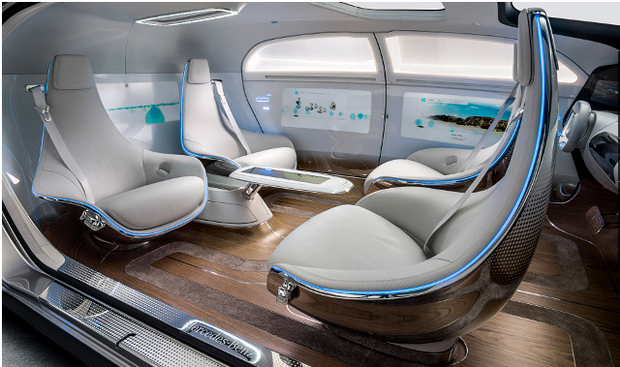 Cars may become the new homes in many places of the world. With the high cost of living, it is not hard to believe that mobile homes become a new standard way to live for many people. By this time the cost of self-driving cars transportation and reliability will make trips of 1000 miles or less easier and faster with a car than other modes of transit. Until the hyperloop becomes widespread we will be driving more and taking the plane still.